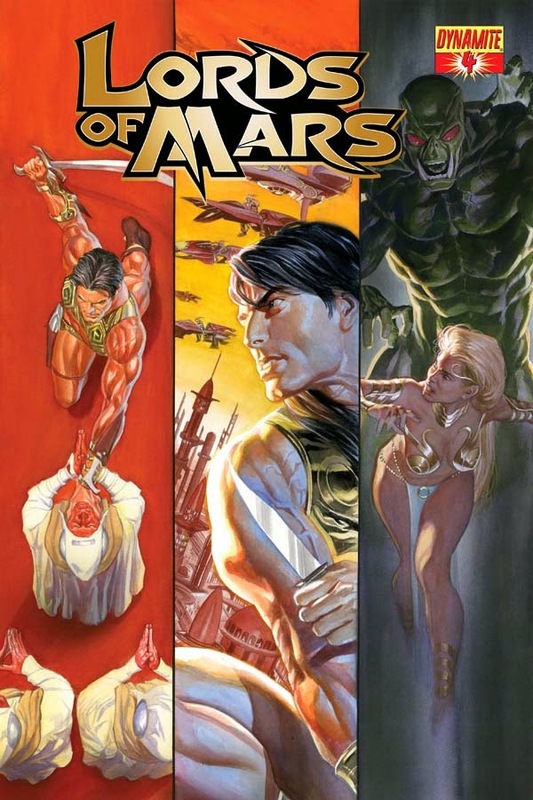 The Fellowship was fortunate enough to obtain a copy of LORDS OF MARS #4 from Dynamite Entertainment. The story is by Arvid Nelson, illustrated by Roberto Castro, colors by Alex Guimaraes, and lettering by Marshall Dillon. John Carter is leading a group to the Therns fortress located at the Valley Dor to find out what happened to their ambassador. Little does Carter know that the Therns have been telling Tarzan that he is an evil dictator. Jane doesn’t believe the lies and tries to convince Tarzan, but is captured by Thern’s guards. Thern attacks Carter’s ships and the Warlord is quickly captured. The next thing he knows, he’s in an arena…and about to fight Tarzan! The issue (and the series as a whole) has been a solid, enjoyable read. The problem (albeit a minor one) is this is the fourth chapter of a six issue mini-series, and our heroes finally meet. I can see why it went this way; it draws excitement leading up to the final meet up of the Burroughs’ characters. The drawback is they have to resolve their differences, join forces and deal with the legitimate threat…in two issues. I would preferred them getting together earlier in the story so we can enjoy the team up. Other than that, I like the book. Castro’s art and Guimaraes’ color work is top notch and great to look at. LORDS OF MARS #4 is in stores now, or available to order at www.Dynamite.com.